Rituals are prominent in Indian religions. So also in our politics. When constitutional institutions are inclining towards dysfunction, we will observe a Constitution Day. When the bureaucracy badly needs to be reformed and made people-friendly, the official calendar will have a Civil Services Day. When the people increasingly perceive the government as ineffective and corrupt, the response is to mark the Christmas day as 'Good Governance Day'. The recent goingon in the higher judiciary and the mountain of pending cases in courts are perceived as problems. Perhaps we will be asked to mark a Good Justice Day. Such ritualistic obeisance does not necessarily mean any great movement for closing the wide gaps that exist between the objectives the official Days set out in the government calendar and the actual experience of the people. Shorn of ideological colour, good governance is about clean politics, good politics, inclusive politics, politics of catechism--constant questioning. Advocates of good governance, including some political leaders elected through free and fair electoral contest, tend to say 'trust me, let not politics (dissent), interfere. I will deliver faster'. That's the antithesis of a free democracy that thrives on the oxygen of dissent and consultative policymaking and multiple–levels of accountability. loved Singapore model. But governance in a democracy is defined by the nature and quality of its politics and, therefore, has to be understood in a more broader context. The politics in a democracy postulates choice, dissent, contest relating to policy, the way it is arrived at and delivered. A web of feed-back loops connect the elected with electors, checks and balances. Both the process and outcome are important. To use a metaphor, politics is the climate for the weather of good governance. The focus on good governance has caught international attention, especially from the IMF and the World Bank during the last 30-40 years. The two agencies have also helped in setting parameters for measuring good governance and ranking nations that is welcome. However, their preoccupation is with implementation of the conditions-- structural adjustment--imposed on governments which avail of their loans. That itself introduces politics biased in favour of markets, capitalism, and business. T.N. Seshan The measurement parameters are neutral about the moral basis of democracy and its standards of good governance. Ease of doing business, competiveness of an economy, and such other qualities promoting growth, health of BoP gain prominence over equity, human rights and democratic vigilance over the governing polity. Fortunately, the financial melt-down in 2007-08, the backlash against globalization and free trade and businesses (essentially Wall Street and Fleet Street) in the West, has persuaded these agencies, and World Economic Forum, WTO, to make token concessions by saying that measures are required to include sections of people not benefitting from globalised free trade and foot-loose finance. Former finance minister P.Chidambaram wrote a series of articles in newspapers and compiled them into a book titled:' Good Economics is Good Politics. As finance minster in the UPA-I, he had called the left parties supporting the government as : 'my conscience keepers'. As a result, 'inclusive development' entered the economic lexicon. In his budget of 2004, for the first time spending was linked to outcomes. But no results occurred. In the elitist discourse, democracy, federalism, courts and politics are blamed for such lack of desired outcomes. Do we follow up on such objections and opt for by-passing the democratic processes, invest strong leadership with powers to think for the people and achieve results? This experiment was tried during Prime Minister Indira Gandhi's emergency in 1975-76. Her 20-point programme included items for responsive administration and grievance redressal mechanism. 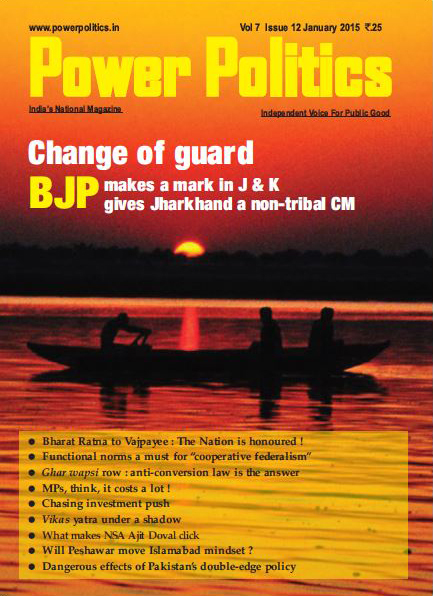 While it made the government machinery unaccountable, governance did not improve. The short point is that both politics and governance are indispensable and are not mutually exclusive. While governance theory says politics and governance out to be separated, and each should function in distinct spheres, this ideal rarely works in the real world. Governance cannot, and will not be good, so long as politics in the political system is not, clean, responsible, responsive and continuously held accountable. Good governance and free democracy are said to be the two sides of the same coin. Governance, narrowly understood, often means administration by the ruling political executive and its 'efficient' administrative arm. That may be correct in authoritariantechnocratic rule-the much loved Singapore . Governance in a democracy is defined by the nature and quality of its politics and therefore, has to be understood in a more broader context. The politics in a democracy postulates choice, dissent, contest relating to policy, the way it is arrived at and delivered. A web of feed-back loops connect the elected with electors, checks and balances. Both the process and outcome are important. To use a metaphor, politics is the climate for the weather of good governance. governance tend to put the cart before the horse and ignore the dysfunction in the political institutions created or recognised by the constitution. For example, our constitution recognises the political parties and broad oversight over their functioning is entrusted to the Election Commission. This institution had two distinct phasesbefore and after Sheshan. Governance to be delivered by the electoral machinery under former Chief Election commissioner T.N. 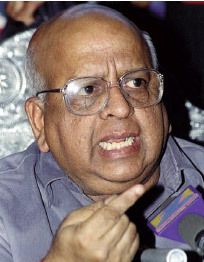 Seshan won the trust of the people because the chief election commissioner was seen to be dealing with some of the ills of politics. The shine put on ECI by Seshan is fading slowly. The Commission is constrained to accept the new normal and recommends that the Lok Sabha should at least meet for 70 days. It also laments that even on the limited number of days on which it meets, the House business is disrupted. Today's rulers were yesterday's disruptors of the House and the present Opposition was at the receiving end. In the states, the legislatures matter only when the government of the day is forced to face a vote of confidence motion. Not infrequently one witnesses legislators kept captive in luxury resorts to prevent poaching by rival bidders for their vote. It shows the commercial value of vote and politics that frames governance. 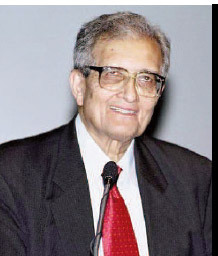 Amrtya Sen The dysfunctional political system affects governance down the line. The line taken by some that the administrative arm, i.e. the bureaucracy, should be autonomous and implement policy determined by such politics flies in the face of reality. e-Governance has the potential to enable good governance. The DBT or directly transferring benefits initiated by UPA and successfully implemented and expanded by NDA shows the potential. Behind the click, there is a palm to be greased. Anyone who goes to register a property transaction knows that before his or her biometric identity is captured, there are multiple levels to be pleased. Such non-e transactions would not be taking place if there was no political protection for them. e-Governance has thus far has largely remained a potential. As a writer on public administration, Prof. Riggs pointed out that even the state of art technology goes through a process of refraction in society's like ours. The transmission is not linear but deviates, due to politics in the choice of technology, choice of providers, as well as socioeconomic barriers that are not taken into account. The oxygen of good governance is transparency. It is the other face of accountability. The entire political system should function under sunshine, such as the Right to Information Act, scrutiny by free media and by nongovernment organisations representing different interests. This assumes more importance because the legislatures have abdicated their responsibilities of over-sight. Thus authorities both at the centre and the states tend to treat such scrutiny as obstacles to 'progress'. Official and unofficial attempts are made to diminish, or denigrate, the role of institutions of free democracy considered as politically inconvenient. Good governance and free democracy are said to be the two sides of the same coin. Governance, narrowly understood, often means administration by the ruling political executive and its 'efficient' administrative arm. That may be correct in authoritariantechnocratic rule--the much loved Singapore model. But governance in a democracy is defined by the nature and quality of its politics and, therefore, has to be understood in a more broader context. A new politically convenient 'information and media bubble' is sought to be created under the banner of 'progress and good governance'. Sadly, the space outside this bubble is shrinking. This is not to say that good governance has not received the attention of successive governments. Delivery of certain common services in digital mode, DBT, the 'bhhomi' initiative for recording land ownership, e-filing of taxes, digital payment system are noteworthy efforts with far reaching impact. Given the dominance of government in managing our day to day lives and the socio-economic order, both the pace of scaling up and the quality is low. One reason could be that the entire political system is not owning good governance as good politics that deserves and earns people's trust. Relegating good governance to procedural reforms and incremental digitisation by administrative wings now underway though welcome make us miss the larger contribution of good governance to our democratic polity. The polluted politics is like the polluted climate that spreads itself as the weather defining good governance. If one wants to sum up progress on good governance programmes in two words, it could be "Uncertain Glory' (used by Prof. Amrtya Sen for summing up India's socio-economic achievements). Good governance, like democracy, religion, god, allows itself to be hijacked and self-certified. Its meaning is not in the two words that make it up but in the experience and perception of large sections people at the receiving end of politics, its ability to hold the Government accountable is weakened. The United States House of Representatives met for an average of 140 days every year during the same period. Shorn of ideological colour, good governance is about clean politics, good politics, inclusive politics, politics of catechism--constant questioning. Advocates of good governance, including some political leaders elected through free and fair electoral contest, tend to say 'trust me, let not politics (dissent), interfere. I will deliver faster'. That's the antithesis of a free democracy that thrives on the oxygen of dissent and consultative policy-making and multiple–levels of accountability. The author is a highly distinguished observer of public affairs. He has been India's Principal Information Officer and Advisor to several Prime Ministers.